The Ashcroft High School Student Leadership Committee gathered together to surprise a young local boy with his very own Freedom Wheels bike – supported by the wonderful efforts of the students. Freedom Wheels bikes are specially made with extra supports for children with a range of disabilities. Some often cannot walk – but they can ride. Other children need support with balance and quiet training wheels which the special Freedom Wheels bikes provide. 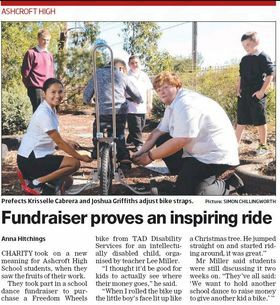 Ashcroft High School students have supported the TAD Freedom Wheels bikes for a number of years. The students work hard to fundraise through school discos, mufti days and other activities to cover the cost of a special bike for a local child. On Wednesday 14th May the Student Leadership Committee gathered together to surprise a young local boy with his very own Freedom Wheels bike. The boy had no idea why he, his foster mother and his case worker were visiting the school. Much to his surprise he was presented with his new bike, made especially for him and the students and their teacher, Lee Miller, had even attached a big bow and flashing light. The boy has a few different diagnoses including Tourette’s Syndrome which causes ‘tics’ – an involuntary movement – which affects his balance so he was unable to ride a two wheeler bike. The extra modifications on his Freedom Wheels bike provide support for balance so he can ride safely, confidently and improve his gross motor skills. The continued efforts of Ashcroft High School and teacher, Lee Miller, mean more local children with disabilities can enjoy the thrill of riding a bike. Read the Liverpool Leader Story here.